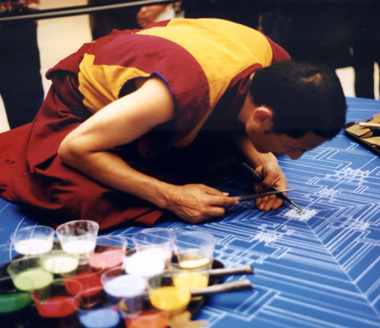 Eleven years later, in June of 2008, Laurie and I went to the American Visionary Art Museum in Baltimore to watch four monks from Tibet's Gaden Jangtse Monastery work on another sand mandela. The middle shot and bottom shots at the left were taken on June 27, the second day of the four-day project. It took less than a year before I had my third and most extensive experience with sand mandalas. You can see a picture of the 2009 mandala which was constructed at the University of Northern Iowa here. Because Buddhist tradition emphasizes the ephemeral nature of everything man accomplishes, sand mandalas are destroyed the moment they're completed. Complex art that's made to be unmade  now that's cool. 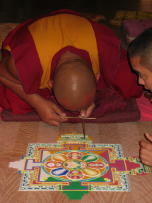 You can read about the practice and see photos of completed sand mandalas here.